Well, dear reader, thanks to my good friends Kate and Maryann and my dear sister Nancy, I feel SO MUCH BETTER today than I did yesterday. I turned over a new leaf and put together a calendar for 2010 using photographs from Arisugawa Park. I ordered five copies - one for each of the fishermen. When the calendars arrive (in about ten days) I will take them to the park with a note written in Japanese (with Ken's help) and apologize for not asking their permission to take photographs. I have learned my lesson. Hopefully I will be forgiven. 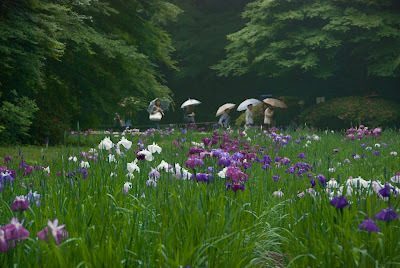 In the meantime, here's a photo of the Iris Garden taken a few days ago at the Meiji Shrine. I hope these ladies don't mind that I took their picture too. That´s a great photo composition, with great color, congratulations for the nice work. All the best, from portugal, have a nice day.